I have received many questions from readers wondering how they can reach out to friends with chronic illness and help them in practical and realistic ways. It has been so encouraging to me to hear about the desires you have to love and serve those you know with chronic illness. Because this is a question I have heard so much lately, I have decided to write a blog post series on friendship and chronic illness. Give support for the family. Enter into your friend's world. There are some fun things planned for this Chronic Illness and Friendship series. Later on in October there will be a giveaway! If you have a friend with a chronic illness, you will be interested in this. There will also be a special guest here in a few weeks! Friendship goes both ways, and I have asked a friend of mine to share some ideas for how those of us who are ill can reach out in friendship to our healthy friends. If you have specific questions or something else you want to know about chronic illness and friendship, please leave a comment and let me know. 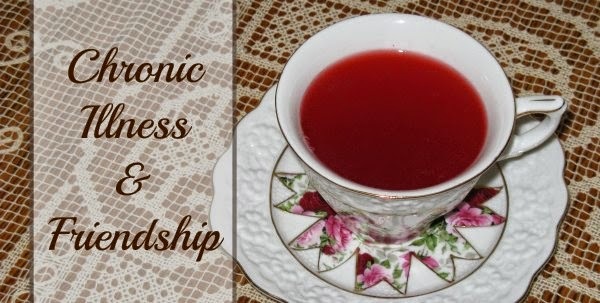 I hope that this series on friendship and chronic illness will be beneficial for both the healthy and the chronically ill as we seek to be good friends to those whom God has placed in our lives. Edited to add: This Chronic Illness and Friendship button is now on the sidebar of my blog. You can click on the button to easily access all of the posts from this series anytime. Thank you for doing this, Rachel. People easily support "guest speakers" about chronic illness during their visits to our city. But almost never reach out to those in their midst who live with the same issues. It is so much easier to "support" for a day than it is to help day in/day out! When my friends finally understood and believed me about the illness I was dealing with, it was such a blessing, and it brought healing to my heart. Looking forward to reading this series, Rachel! It is indeed such a blessing when friends understand and believe us about the illness we face. I'm so glad you have understanding friends! Thanks for doing this, Rachel. Most of us live lonely lives. Perhaps your series will help us better communicate with those we love. I hope to learn from your life.